At once a timeline, an autobiography, and a meditation, Glexis Novoa’s exhibition is encircled by a site-specific drawing of a horizon line along the gallery walls, punctuated by the artist’s small, meticulously rendered images of cultural and political landmarks. The scenes involve people, flags, and banners emblazoned with “Fidel,” “Socialismo,” and “Yankees Go Home,” as well as sketches of Cold War missiles and Havana’s Revolutionary Plaza. The work unfolds through space and time. As visitors walk the perimeter, tracing the drawing from beginning to end, they grasp in an embodied manner the artist’s migration history, one of political exile—from Cuba to Mexico to Miami—and of spiritual growth, concluding with pictures of sacred Buddhist temples. In the center of the gallery, similar drawings rendered on concrete slabs sit atop three pedestals that recall abstract modernist sculptures. Whereas Novoa's large-scale intervention references specific histories, these images juxtapose incongruent architectures, as if to create a sci-fi skyline. 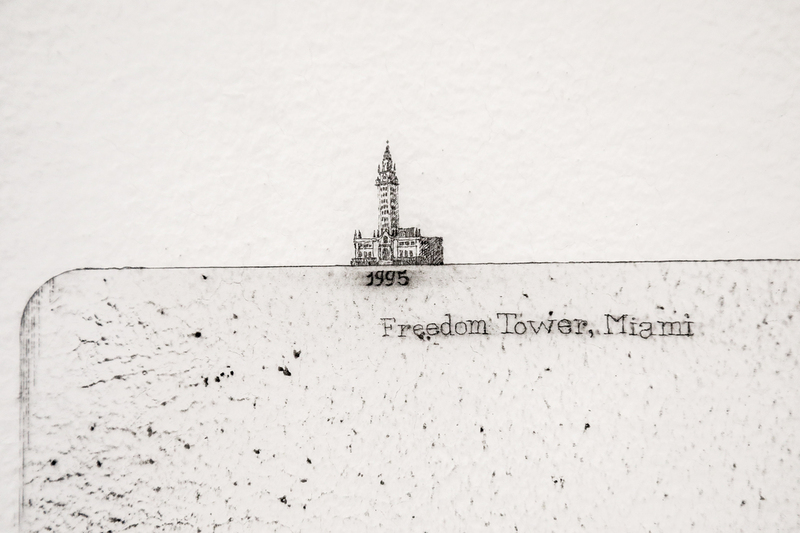 But the surrounding horizon is not free of such imaginative leaps: Between the handwritten markers for 1994, with its depiction of a mountain in Monterrey, Mexico, and 1995, with its illustration of Miami’s Freedom Tower (the building in which Cuban refugees were historically processed and that now houses this gallery), Novoa depicts a deep chasm that gives way to an uninterrupted line on the north wall. On the Miami side of the horizon, he penciled in “2005” and “2007,” but these years stand alone, unpaired with any image beyond the horizontal graphite marks evoking geographic layers. Given how the artist’s past resonates with this specific site of immigration history, one might be prompted to fill such absences with reflections on the other motivations and consequences of migration—both spiritual and political—that persist today.